Click here to open a powerpoint copy of this graph. Burning one gallon of gas releases about 20 pounds of carbon dioxide (another 20 percent is released in producing gasoline). Every 100 gallons saved reduces carbon dioxide emissions by 1 ton. GPM shows that replacing the most inefficient cars (those with MPG in the teens) yields larger gas savings than improving already efficient cars. For example, convincing someone to trade in a 14 MPG car for a 20 MPG car reduces as much gas as having two people trade in a 33 MPG car for a 50 MPG car over the same distance. Does the GPM argument apply only to today's highly inefficient cars? What if all cars in 2020 are "efficient" by 2009 standards (e.g., 50 MPG and above)? Is GPM still useful? The answer is yes. Imagine that by 2020 cars range in MPG from 50 MPG (the Escalade superhybrid) to 170 MPG (the Prius superhybrid). GPM shows that the policy focus will always need to be on removing the most inefficient vehicles: Replacing a 50 MPG car with a 65 MPG car saves more gas (over a given distance) than replacing a 100 MPG car with a 170 MPG car. Because of the curvilinear relationship between GPM and MPG, MPG will be potentially misleading even as cars become increasingly efficient. The benefits of thinking in terms of GPM will hold for all future efficiency levels, not just for today's SUVs. This May 29 post has several tables that can help you calculate the gas savings from a Cash for Clunkers trade in. The table makes clear that small MPG improvements on inefficient cars (e.g., 11 to 12.5, 14 to 16.5) save a large amount of gas. Replacing a 14 MPG car with a 25 MPG car saves more gas over a given distance than any possible improvement to a 33 MPG car. Greenhouse gas policy needs to focus on removing the most inefficient cars. This table makes clear the diminishing marginal returns to higher MPG. These tables are summarized in this pdf file. Print it and keep it with you to calculate gas consumption when buying a new car. An online GPM calculator can be found at this post. It also contains calculators for all new 2009 cars. The second file (for two cars) is useful for (1) comparing the difference in efficiency between two cars, in which case one would use a single distance for both cars, and for (2) comparing total gas consumption for two cars in the same household, in which case one can let the distances of both cars vary to match expected driving. If you find graphs helpful, the following picture shows the amount of gas used (on the y-axis) for different levels of MPG (shown as different lines) and for different distances of driving (on the x-axis). Click on the icon below to go to a two-page pdf file (click here for the pdf or here for a powerpoint file). The first page contains MPG values that range from 10 to 50; the second page contains MPG values for (relatively) efficient cars that range from 20 to 50. Test your understanding of fuel efficiency with this interactive quiz. Go here for the original Science article. This March 2009 post offers a current overview. What is the problem with MPG? Consider a decision between two cars--a current vehicle and a new vehicle that is more efficient. Which improvement will save the most gas over 10,000 miles? Surprisingly, all save about the same amount of gas over 10,000 miles: About 100 gallons. We want to emphasize that a higher MPG car is always more efficient than a lower MPG car for a given distance. We are not saying that a car that getst 11 MPG is somehow better than a car that gets 50 MPG -- to the contrary, we encourage all drivers to buy the most efficient vehicle they can. What we are saying is that MPG can be confusing when thinking about the benefits of improving MPG. The bottom line is that equal increases in MPG are not equal in gas savings. As the examples above shows, small MPG improvements on inefficient cars can save a lot of gas. Of course, most people look at an improvement from 10 to 11, or 16 to 20, and think, why bother? But replacing an inefficient car with a car that is more efficient -- even by just a few miles per gallon -- is valuable in both gas savings and greenhouse gas reductions. Every 100 gallons saved reduces carbon dioxide emissions by 1 ton. In short, you cannot simply look at an MPG increase from one vehicle to another to know the gas savings. Also, when a family thinks about its average fuel consumption, it cannot simply take an average MPG levels of two vehicles. Given two cars that are driven the same distance, the combination of 18 MPG and 50 MPG uses more gas than the combination of 28 MPG and 30 MPG. Direct comparisons of MPG is what leads to illusions. In each case, you have to convert MPG to know the amount of gas used. * We describe this step next. The solution to this illusion is thinking about gallons of gas used over some meaningful distance. We will use the term GPM (gallons per mile) as a general shorthand for expressing gas consumption over a given distance. We will focus specifically on Gallons Per 10,000 Miles. Of course, because people do drive different distances in a year, final GPM numbers need to be tailored for each person's own circumstance. The tables and calculators below do the GPM math for you. Another way of framing the basic issue is "Which is more useful to know: How far you can drive on a gallon of gas? Or, how much gas you will use while owning a car?" MPG answers the first question. GPM answers the second question. We suspect that, when buying a car, most people want to know gas consumption. Gas consumption, as measured by GPM, can be directly translated to the cost of driving the car and to the amount of greenhouse gas emissions. MPG cannot. MPG vs. GPM - Which is more Useful? Does using GPM imply that MPG should be scrapped? No. MPG is useful. Specifically, MPG tells you the range of your car's gas tank. For example, MPG can help you decide whether you can wait two more exits to refill your tank. Both MPG and GPM have a useful role at different points in owning a car. MPG is useful when you're driving a car. GPM is useful when you're purchasing a car -- it better captures the fuel consumption, and fuel savings, when comparing a current car to a new car, or when comparing two new cars to each other. Note that both measures serve equally well to tell you what is more efficient: 50 MPG is better than 20 MPG; 200 gallons per 10,000 miles is better than 500 gallons per 10,000 miles. They are not equal, however, in accurately conveying the gas savings from efficiency gains. GPM spells out in clear numbers how much gas one is going to use. 1,000 gallons per 10,000 miles is clearly dreadful. 200 gallons per 10,000 is clearly great. One can immediately tell how much a car will cost to fuel over 10,000 miles. One can see the actual magnitude of the gas savings when comparing a more efficient car to a less efficient car. Specifically, one can subtract one car's GPM from another to see the gas savings. MPG cannot be subtracted. None of these outcomes is apparent with MPG until you do more math. 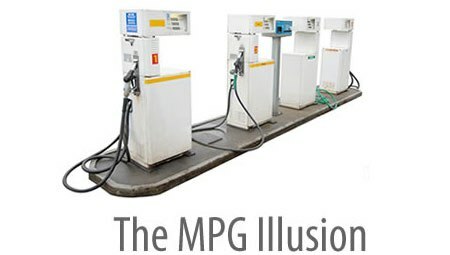 For those mathematically inclined, the cause of the illusion is simple: MPG creates an illusion because it is a ratio. By necessity, MPG has a curvilinear relationship with its inverse (GPM). Because people do not spontaneously take the reciprocal, they incorrectly map changes in MPG to changes in amount of gas consumed. 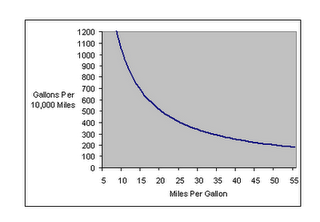 The formula for calculating GPM in this graph is 10,000 miles divided by MPG. Download a powerpoint copy of this graph here. Some people expect that, although linear reasoning with MPG is incorrect, percentage increases in MPG captures amount of gas saved over a given distance. Even percentages, however, are prone to illusions with MPG. See this note for three examples of why percentage improvement fails. For example, it is easy to see in the example given above that improving from 10 to 11 MPG is a 10% improvement; 16.5 to 20 MPG is a 20% improvement; and 33 to 50 MPG is a 50% improvement. Although they all represent different percentage improvements in MPG, they all save 100 gallons of gas over 10,000 miles. Although an improvement from 10 MPG to 13 MPG is only a 30% improvement, it saves more than twice the gas of the 50% improvement from 33 to 50 MPG. The problem with percentage reasoning is that it needs to be applied to a starting level of gas consumed; that amount differs over different levels of MPG. It is captured in GPM. Many countries currently use liters per 100 kilometers, which has the right numerator (volume) and denominator (distance) for judging efficiency gains. However, some people living in those countries have questioned how helpful it has been. We think that the base distance should be larger so that differences between efficiency levels are clearer and involve fewer decimal places. Go here for more thoughts on the metric system. *Technically speaking, GPM is an intermediate step in calculating the harmonic mean used to measure automaker compliance with CAFE standards. A family also needs to calculate a harmonic mean to understand their total fuel efficiency-the family can't simply weight the MPG of two vehicles by their respective driving distances.